I wrote about the impact of repetition, even using a very basic design here. To see the results of makin kaleidoscope canes from very beautiful and complex canes, see Carol Simmons’ work here and here. I took very simple canes – bulls-eyes, stripes, squares and a basic leaf, and packed these together to form a triangular cane (below left). This was reduced and cut 8 times to form the kaleidoscope cane (in the middle of picture below right). 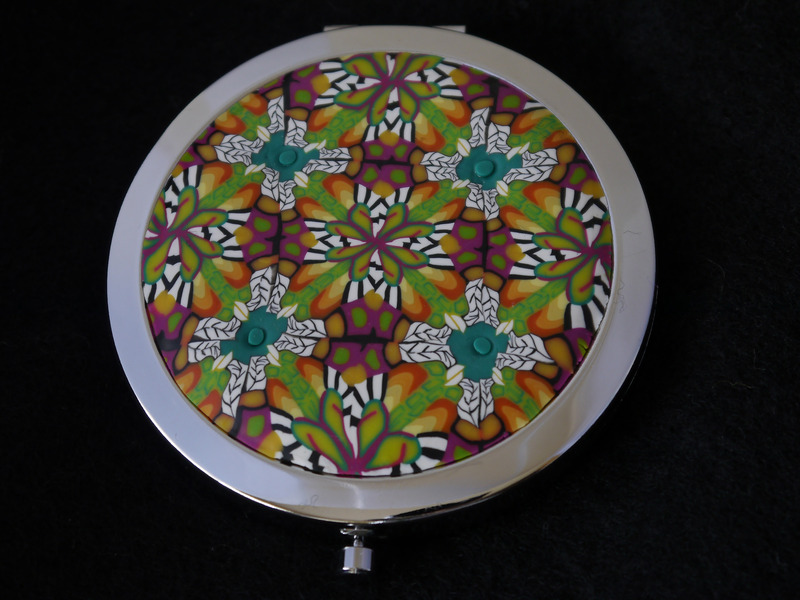 Thin slices are then used to cover a blank purse mirror – after first covering the metal with PVA glue (which is allowed to dry) I use liquid polymer clay for a strong bond.